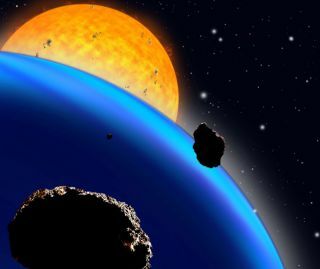 Artist's depiction of an extrasolar planet encircled by small asteroids as it orbits a bright star. Telescopes could analyze the sunlight reflected of a distant planet to learn whether it is inhabited. AlthoughCaptain Kirk and crew could zip over to a planet at warp speed and teleportdown to the surface to check if it was inhabited, current-day scientists willgenerally have to search for life from a distance. New research gives some hopethat we could detect a "handedness" beacon from a planet full ofmicrobes. Thishandedness, or homochirality, is characteristic of life on Earth. The moleculesthat make proteins and DNA all have either a left-handed or right-handedorientation. Both orientations are made in equal quantities by non-biologicalprocesses, but life prefers to have just one type of hand over the other. "Homochiralityis a fundamental aspect of self-replication," says William Sparks of the SpaceTelescope Science Institute. "It is a reasonable proposition that life on otherplanets will exhibit a particular handedness." Many of themolecules in organic chemistry come in left and right-handed varieties. Whenlife starts building up larger compounds from these organic ingredients,scientists suspect that having only one hand to deal with is an advantage, ifnot a necessity. Detectinghomochirality in purified samples is easy in the lab, but could we see thesignal if we steppedback 40 light-years and looked at an entire planet? "Weare testing whether we can remotely sense something that we think is a genericaspect of life," says Sparks. Asdescribed in a recent paper in the Proceedings of National Academy ofSciences, Sparks and his colleagues found that the light coming off tinymicrobes is partially polarized. If a similar amount of polarization reflectsoff alien microbes from a distant planet, it might be measurable with futuretelescopes. Decidingwhat might constitute a smokinggun for life on faraway planets is an active field of research. The classicbiosignature is an atmosphere far from equilibrium. Certain molecules can onlysurvive for a short time, so if astronomers detect them in the spectrum oflight coming from a distant planet, we might assume that living things arereplenishing the supply. Anothercalling card of life might be the vegetation red edge, which is due to plantsabsorbing strongly in the visible wavelengths but reflecting infrared light. Alienplants may capture the light from their host star in a similar fashion. However,there are geological phenomena that can mimic these supposed biologicalindicators. Volcanoes can replenish the atmosphere with short-lifetime gases,and some minerals have a red-edge-like reflection spectrum. Thisambiguity led Sparks and his colleagues to consider an alternativebiosignature. The homochiralityof organic material was discovered in 1848 by Louis Pasteur, who explained whysome biologically-derived molecules rotated the direction of polarized light. Even now,scientists use polarization of light as a way to study biological samples. Buttypically these experiments work with purified extractions of single molecules.It is rare to study the polarized light signal coming from a full livingorganism. However, anumber of earlier experiments studied plant leaves and found that about 1 percentof the reflected light was circularly polarized (meaning the electric fieldrotated in a clockwise or counterclockwise direction). Sparks andhis fellow researchers decided to look further down the evolutionary tree,since simple microbial organisms might be a more common form of life on otherplanets than leafy plants. Theresearchers chose marine cyanobacteria, which are photosynthesizing bacteriathat appeared on Earth between 2 and 3 billion years ago. Organisms thatphotosynthesize light are probably the best bet for being an observable part ofthe reflected light from a planet. They live out in the open (as opposed todeep underground or underwater) and absorb light at the dominant frequencies ofthe host star. The teamput the microbes in a Petri dish and shone unpolarized light on them. A specialpolarimeter measured the circular polarization of the reflected and transmittedlight. The teamfound a polarization signal between 0.1 and 0.01 percent (the value of thesignal depended on the wavelength of light). Minerals and other non-livingobjects typically do not polarize light to this extent. State-of-the-artpolarimeters can detect signals of 1 part in a million. "It's not easy,but it can be done," Sparks says. That might seemgood enough to spot the microbes that Sparks and colleagues tested, but thelight coming from a planet will be a mixture of light scatteringoff clouds, rocks and other sources. To be detectable, the authors contendthat microbial colonies will need to provide 1 to 10 percent of the light froma viewing scene. Sparks andothers have actually looked for this signal from a not-so-far-away planet.Using ground telescopes they scanned the surface of Mars in 2005 looking forpolarization at the level of 1 part in 1000. They didn't see anything, which issomewhat reassuring, Sparks says, since it implies that the polarization signalfrom terrestrial planets will not be overwhelmed by some non-biological source. Observingpolarization from planets outside our solar system will be harder. Sparks saysgetting enough photons will be "a stretch" for the Terrestrial PlanetFinder, which is a proposed space mission to directly image exoplanets. Thechances might be better with huge telescopes being planned for the ground, suchas the European Extremely Large Telescope. This 42-meter-wide "lightbucket" could potentially collect enough photons to see a small planetarypolarization effect. Aninteresting question is whether our own blue planet emits a polarizationsignal. "We don't know since no one has looked," Sparks says. Histeam calculated that regions of the ocean with lots of cyanobacteria shouldhave a circularly polarized signal of 1 part in 10,000. The team iscurrently looking into possible field measurements over the ocean, as well asover forests and other vegetation, to precisely measure the polarization signalof Earth?s own life from a distance. What Does ET Look Like from 40 Light Years Away? Star Light, Star Bright, Any Oxygen Tonight?